The tension in the interval start race comes down to watching the clock. The seconds tick, the time checks pass, the squirm of the of the skier in the leader’s chair only quelled after the top-prospects slide past the finish — and there’s only a reference to time back. On Dec. 12, that was France’s Maurice Manificat, the thirty-two-year-old skate skiing star, residing where he often belongs, sitting in the leader’s chair in Davos, Switzerland during the 15-kilometer skate. In bib 39, Manificat set the fastest time of the earlier starters. As the other would-be-winners came in, Manificat’s lead held. Until Russia’s Evgeniy Belov bested Manificat’s time by 0.9 seconds. 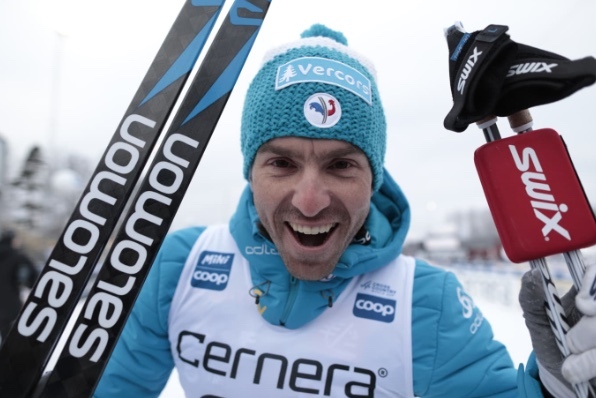 The Frenchman finished second in what was his first World Cup start of the season. Today in Ulricehamn, Sweden in the men’s 15 k skate, it was déjà vu all over again. Manificat in bib 39. Manificat in the leader’s chair waiting for the possible bigger guns on the day to cross the line. Manificat’s time of 34:55.4 minutes held, just barely, for the win. Simen Hegstad Krüger, the day’s 46th starter, stopped the clock 1.1 seconds back for second place. Didrik Tønseth, also of Norway, came in third (+8.7). 2017 in Ulricehamn was also a time when Alex Harvey reigned supreme in the 15 k skate. He won that day’s 15 k skate by six seconds over Norway’s Martin Johnsrud Sundby. At thirty-years-old Harvey has been near, but not at the top of his form this season. Harvey, who placed third last season in the Tour de Ski (TdS), pulled himself from this season’s TdS after placing 22nd in stage 5. He took an extended break from Europe to train and rest at his home in Quebec. Today saw a different Harvey return to the World Cup. He placed ninth in Saturday’s 15 k skate, 31.4 seconds back. Harvey explained in a post-race call that he feels rejuvenated and satisfied with the result, despite having flown to Europe on Wednesday. In the past, Harvey said he had used the TdS as a “launching pad” for the latter part of the season. This year, Harvey sensed the expected performance bump during and after the Tour was in jeopardy. It was a feeling he said he had not experienced since 2012, a lifetime ago on the World Cup. Harvey went on to explain his time in Quebec allowed him to focus on a lovely three letter word, “fun”. The chance to reset was also an opportunity to finetune the training. With low expectations, Harvey started strong in Ulricehamn on Saturday. At 5 k he was off Manificat’s mark by 10.6 seconds with the ninth fastest split. By 10 k, he ceded 30.7 seconds to the eventual winner. For the remainder of the race, he lost only an additional 0.7 seconds to Manificat’s winning mark. As he keeps his eye on Seefeld’s World Championships, starting about a month out, Harvey said he was optimistic. 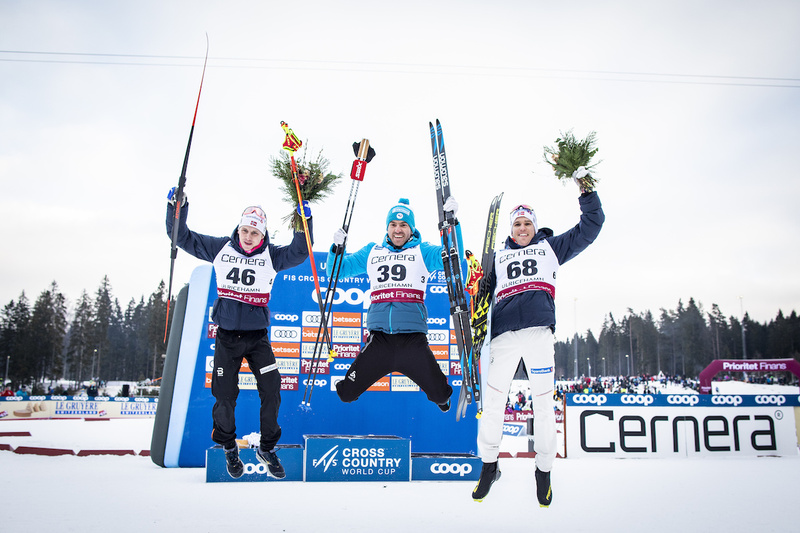 Also for Canada, Lenny Valjas skied to 57th (+2:32.1), and Bob Thompson 77th (+4:16.6). For the U.S., Scott Patterson finished 35th (+1:26.5), David Norris 53rd (+2:11.3), and Ben Lustgarten 64th (+3:04.7). Racing continues tomorrow for the men with a 4 x 7.5 k relay. Jason lives in Bend, Ore., and can often be seen chasing his two boys around town. He’s a self-proclaimed audio geek. That all started back in the early 1990s when he convinced a naive public radio editor he should report a story from Alaska’s, Ruth Gorge. Now, Jason’s common companion is his field-recording gear.